Book binding adhesive is beneath the book's binding strip. The glue holds the book binding in place so the pages can stay intact and the book can have a front and back cover. 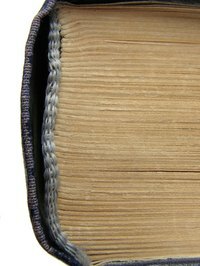 The glue on the book's spine can be removed when replacing the book cover or it might need to be replaced if it is an old book that is falling apart. Insert the book that you want to remove the glue from the binding into the casing press. The backing boards of the press hold the book in place so that you can access the spine of the book. Wet the brown paper towel slightly so that it is damp instead of dripping. Fold in the ends of the paper towel about a half-inch. Place the damp paper towel on the book's spine so the paper towel is between the head of the spine and the tail of the spine. Take care not to use the steam iron too close to the top or bottom edge of the spine, because it can cause staining of the text block. The steam from the iron softens the book binding adhesive so that it can be easily scraped from the spine. Remove the dampened paper towel and use a dull knife to scrape the adhesive from the book spine. If cheesecloth or old paper liners are loose from the steaming, they can also be removed from the spine. Otherwise, they can remain intact and the adhesive removed. The steaming process might need to be repeated to remove stubborn adhesive. If you have an older book, the papers in the book can be more absorbent and the papers will draw moisture from the spine where you are applying the steam and will draw into the book's margins. To avoid this, dampen the spine slowly using dampened paper towels, and work the glue off in a slow and gradual method. Do not use the iron. Take care not to over-steam the the spine so that the gutter margin of the book is not stained.